Businesses want to grab quick growth, especially startups. But the most significant thing they forget or ignore is caring about their workforce. Researches say- many of the startup projects fail only because of ignoring their human resource. Your success depends on your customers' acceptance, but the way to reach them is your employees. Your employees or workforce are like the mast of your business ship. Struggling companies like Dropbox got unimaginable success perfectly handling their human resource. Today, in this age of information and technology; it's easier to recruit, train, monitor and manage your employees just by implementing a smart HRM software. 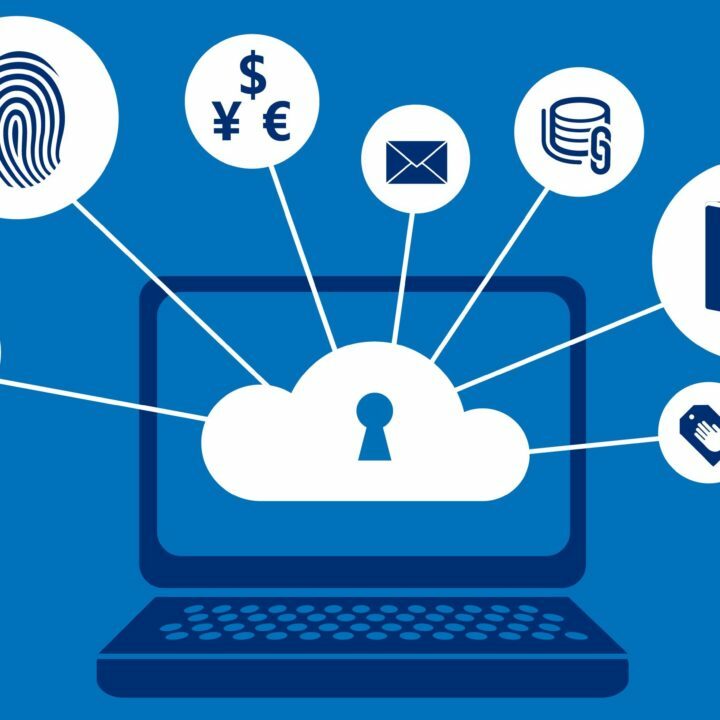 In this post, we have discussed some of the significant hacks and tactics that would help you perfectly utilize your HRM software and increase your team's efficiency. Nowadays, when we talk about hacks or tactics, the first thing appears in our minds is the growth hacking term. It’s one of the newest marketing terms coined by Sean Ellis in 2010, got immense popularity especially in the eCommerce and tech industries. It’s a process of agile experimenting through marketing funnel, software utilization, sales segments, product development, and other fields of the business to distinguish the most efficient ways to ensure the rapid growth of your business. In this growing age of information and technology, we are experiencing the quickest change in our consumers’ mindset. Common marketing or advertising practices couldn’t reach them by maintaining the same speed. Here comes this phenomenal marketing process to the rescue. Check out the Growth hacking funnel. In growth hacking tactics, marketers actually play mind games with their audience. Changing a sentence or color, replacing a CTA button, using keywords, adding a heart touching request, applying a mindblowing idea in their regular ads, campaigns, websites or social media platforms; they try to grab the quick attention and inspire people to make a decision. Amazon generates 57% of its sales using long tail keywords. Dropbox built a marketing team and trained them to reach their target group of audience and started to get results within 7 months! Check out more examples. If you ask what is the connection between using HRM software and Growth hacking practices, I would say- a lot! Usually, a smart HRM software has all the features you may need to build and manage your team. People usually prefer ‘counts'- what or how much features it has. 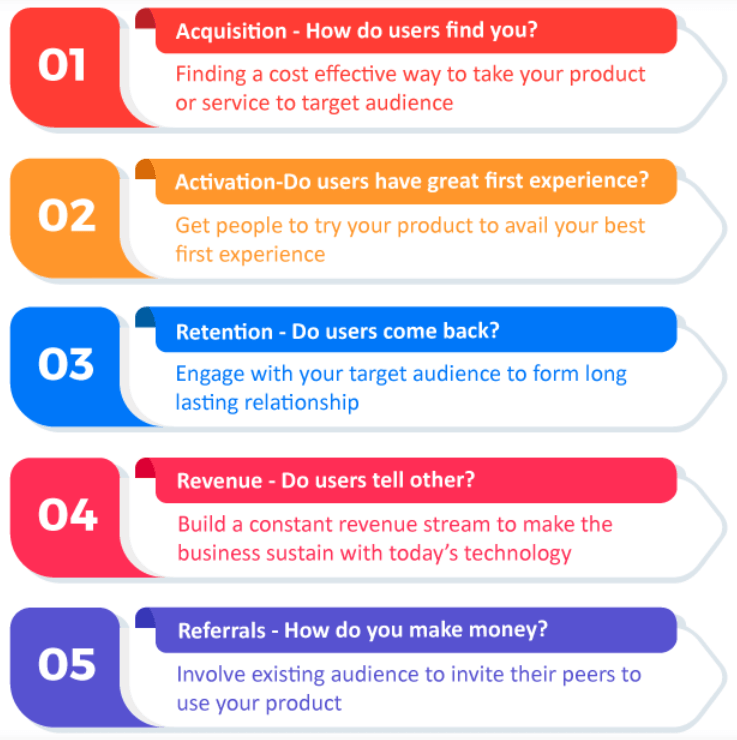 According to Growth hacking approaches, you should prioritize how to apply and experiment these features in different ways. Let's discuss some considerations you should know and remember it while managing a team with HRM software. Remember one thing- you can get actionable ideas and perfectly utilize them only if you can build a smart team. That is why HRM software is a must for you. Our pick here is the WP ERP– the all in one Enterprise Resource Planning (ERP) solution for WordPress users. As we already mentioned, a smart and dedicated team is the most important fact you should consider to get and ensure proper growth. So, try to design your recruitment process in a way that help them know, understand and grow with your ideas and business objectives. If you go through an old-days manual strategy, you may fail to hire the right people. A dedicated HRM software can help you design and apply a recruitment just as you want. People actually observe how perfectly you are dealing with a certain operation. If you can let your employees know and understand what do you expect from them and the best way they can deal with it, then it will surely help you get results very quickly. When an employee enters in a new organization, they could suffer from lots of hesitations. It's your responsibility to make them feel free and go ahead with the main objectives. And a dedicated HR solution of WP ERP would help you do that with ease. Ensuring a collaborative work environment is one of the most significant facts. You know the reason. The question is- how could you use an HRM software in this regard? Employees these days prefer slowing down the work to provide quality works. So, it's really tough to deal with. You can automate assigning works, managing designation, responsibilities, and other facilities, and monitoring the whole process. 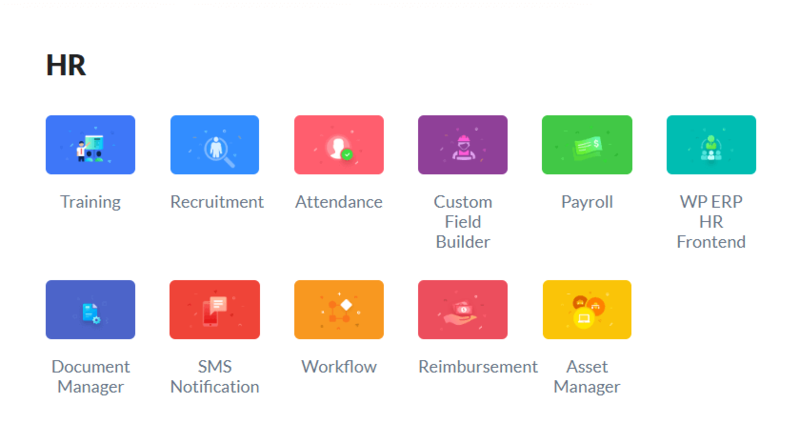 With lots of available options (as you can see in the above screenshot) of your HRM software, you can handle all of their ongoing and upcoming works with ease from a single place. In a well managed and automated work environment, collaboration among the employees is a gift you can be sure about! You can find lots of useful resources on the importance of giving feedback and the best way to deal with it. The question is- does your HRM solution offer a process that is really meaningful and effective? With the HR module of WP ERP, you can set up goals, measure their performance and comment on them in a way you imagine and your employee would love. Transparency is one of the major things to maintain a real friendly and collaborative environment. Helping nature is important among your employees. People usually love to help others when they know that they are helping in a meaningful way. They ignore some distraction or interruption. But as a manager or owner, you should always try to ensure an uninterrupted focus for your employees. Today, employees manage lots of tasks and responsibilities. It's really hard to maintain all of them on time. So, if there are interruptions all the time or for a long period; it could definitely harm their mental health and you could lose both the speed and quality. A perfect workflow design, clear path of growth and time management can save you from having this issue. And a complete ERP solution including HR software is a must these days. To maintain a better work environment and increase your team's efficiency you should show them a certain-clear career path. Someone works and performs with full dedication only if he/she know where to go and how. You should be as honest and responsive as possible in this matter. If your employees are already aware, let them know your plans and future objectives. If not, train them and make aware of where they can go with your company based on their works and capabilities. This is the best-proven way to make employees loyal and get the best output. On the other hand, if you hide something or show the wrong way; there are possibilities to lose. This single mistake can destroy you in no time in this modern age of knowledge and technology. Like old-days, there is no need to monitor your employees all the times. Give them space and freedom, you can check their performances by taking timely reports. With a well developed & advanced ERP solution, you can monitor, calculate & measure each and every moment of their working hours and efficiency. Companies like Google is providing the best possible freedom and facilities to get better output. 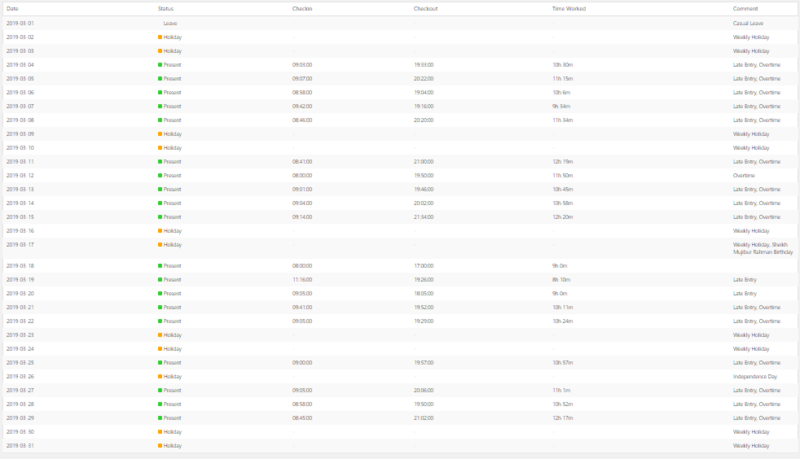 Have a look at the below image, a monthly status report of an employee in a software company. Leave, holidays, check in, check out, stay hours at the office– everything is in your hand by just a simple click. With feedback and performance report, you have options to get time management report, chart and more. Holidays and leave management has a clear and significant impact on the work environment. We work to ensure a better life. As a business owner, you can't forget or ignore it. Mental refreshment offers the actual force and patience to work more and better. You can manage and show your holiday plan and leave distribution with an HRM software by a few clicks. When you are preparing your business plan or a marketing campaign, you should consider holidays regarding both your employees and customers. That will help you to build really an ideal work environment and ensure a quick growth that you want. 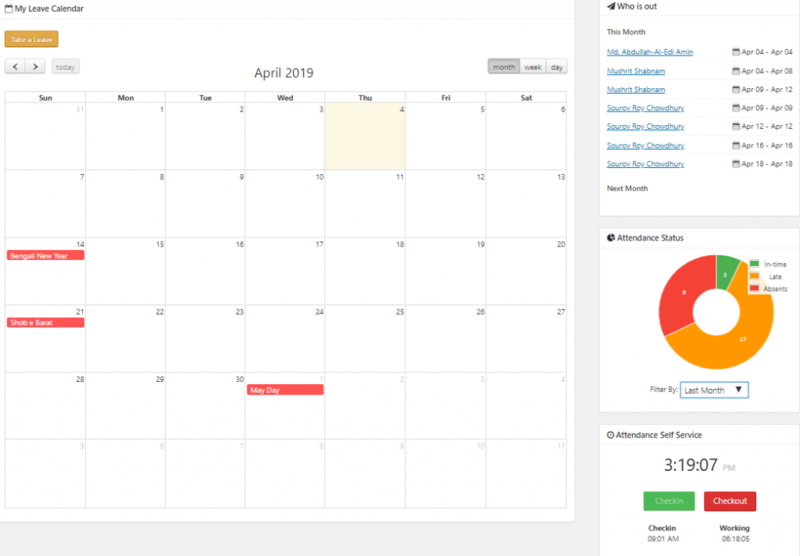 Get a close overview of the HR frontend with WP ERP including leave and holiday calendar, who is out, upcoming birthdays, attendance status, check in time tracker and more. 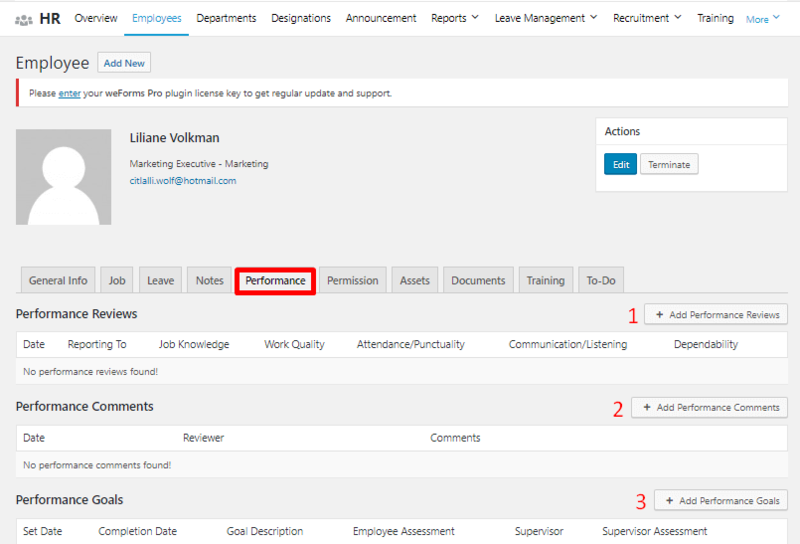 What Else You Can Do with the HR Module of WP ERP? The features and facilities we have discussed up to now, almost all of these are in its basic package. And you can get them free. You may have a question in your mind, can I do some more with this module? The answer is yes, a lot! WP ERP has also some premium packages with more advanced level features. Have a look. 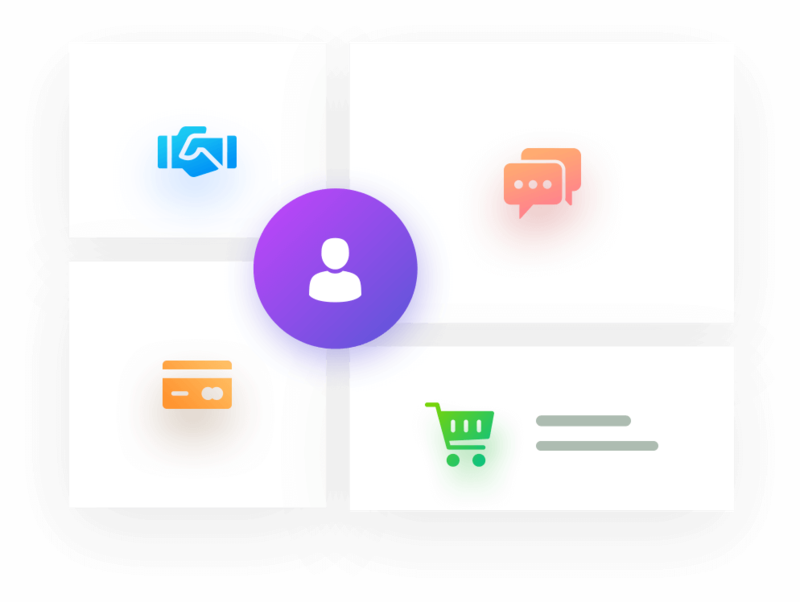 You can perform and manage almost all your required official actions with these extensions. When you have a dedicated team ready to perform, and experiment anything and everything your business needs, your growth would be just a matter of time. Customized HRM software can help you get even more than your expectations. So, try to build and design a team first. You aren't so late to apply Growth hacking practices to get a go. WP ERP is an all in one enterprise resource planning solution for WordPress users. It has three customized modules- HRM, CRM, Accounting and also an independent plugin- WP Project Manager. Have a visit by clicking on the given links (you can use try the demo version) and make your choice. Click to Grab WP ERP Now!